On behalf of all our members, we look forward to seeing you at the ITEC Educational Technology Conference, held at the Iowa Events Center, Des Moines, Iowa. Vendor information is is available here and can also be seen below, but if you have any further questions, please contact Jackie Fonley for more information. Red X Denotes booth is already sold. This Google Sheet denotes which vendor has selected their booth and the corresponding booth selections. Why be an exhibitor at ITEC? 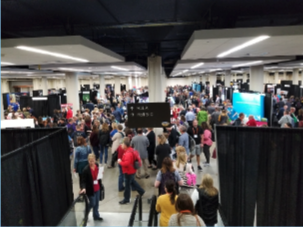 Over 1100 educators and decision makers in attendance at the conference providing hundreds of potential follow-up contacts for future sales. Attendees are comprised of classroom teachers, media specialists, technology directors/IT personnel, administrators, and college educators. Three different times through throughout the conference dedicated to visiting exhibitors. We schedule a morning and afternoon break on Monday, and a morning break on Tuesday with refreshments in the Vendor Hall to attract more people. Lunch is provided with each booth space, allowing you the opportunity to eat with the attendees or to bring lunch back to your booth and be available to attendees during that time. A voluntary vendor activity to increase traffic to your booth by participating in Vendor Bingo. Attendees will be given a Bingo card that must be signed by your booth representatives to qualify them for end of conference prize drawings (minimum value of $50 gift donation to participate in this). ITEC was listed as one of the 2019 K-12 Edtech Events worth attending by Edsurge.com. Monday October 14 – 8:00 AM – 10:30 AM set up time. Vendor Hall opens at 10:30 AM and runs till 4:45 PM. Booth will be located in the vendor hall of the conference (below the main hall). Each booth includes: one 10 x 10 booth space, wireless internet connection, one table, two chairs, one garbage can, and one ticket for lunch on Monday and Tuesday. Booth will be located in the front row of the vendor hall of the conference (below the main hall). Each booth includes: one 10 x 10 booth space, wireless internet connection, one table, two chairs, one garbage can, and one ticket for lunch on Monday and Tuesday. Also includes signage at the refreshment center, recognition in the program, and recognition before the keynotes on Monday and Tuesday. Refreshment level sponsors also have first right of refusal to be one of ten vendors at our spring IT Conference. Booth will be located on the main floor of the conference and includes: four 10 x 10 booth spaces (each space comes with wired internet connection, four tables, eight chairs, one garbage can, and four tickets for lunch on Monday and Tuesday), up to two vendor sessions (if sponsorship is established prior to September 8, 2017), and your company logo in the program, on the slide show prior to the Monday and Tuesday keynotes, specific mention at the Monday welcome session, and on ITEC’s website for one year. Booth location will be in the center of the main conference hall up one level from the vendor hall. This places you in the highest traffic area. Corporate sponsors also have first right of refusal to be one of ten vendors at our spring IT Conference. Please contact Jeff Sypersma, ITEC Executive Director, with questions about Corporate Sponsorship for the conference. Exhibit Hall booth space purchase is required. Opportunity to be a presenter during one of the conference sessions on your product. Your name will be advertised at our student tech fairs in the spring, and on a banner in the booth in the corporate level area when our winners are located during the fall conference. ITEC has purchased a t-shirt cannon. This is a wonderful opportunity for a vendor to distribute promotional t-shirts after the keynotes and at our social event. For $100 ITEC will shoot out a maximum of 10 t-shirts to the audience. We look forward to working with you and having you attend our conference! If you have any questions, or need additional information, please contact one of us.